This was a good side dish for a 3-person meal (we halved 3 larger, round tomatoes), along with fresh pasta one friend made; he topped the pasta with some stir-fried veggies and we were set. Preheat oven to 350° F and set rack close to top. Halve the tomatoes, top-to-bottom, slice them just inside the side that was the top to separate the inside structure from the stem area, and scoop out the middles with a spoon (you can set these aside for tomato soup). 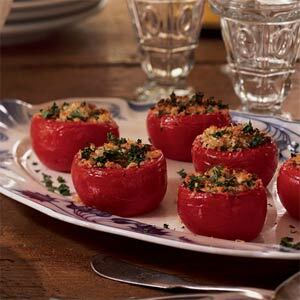 Set empty tomato halves in an un-oiled baking dish so that they just touch. Mix all other ingredients in a bowl. Spoon mixture into the tomato halves, tamping the first bits down a bit and mounding the toppings about half again as high as each tomato half is. Cook 10-15 minutes on upper rack; remove when sausage looks darker brownish and any spilled egg is looking like done, poached egg.